Made some new note pages for the my Filofax A5 Domino planner. The image of the girls running came from an ad in a 1920’s newspaper. 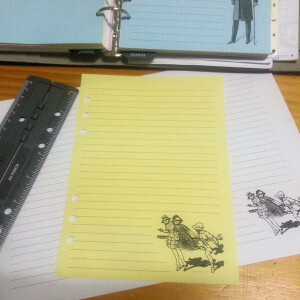 I printed the pages out on yellow A5 flyer paper (I get Quill Flyer Paper 240 pack in four colours from Officeworks in Australia). The PDF file contains two A5 pages, so you can print them singly to A5 paper or two to a sheet of A4. 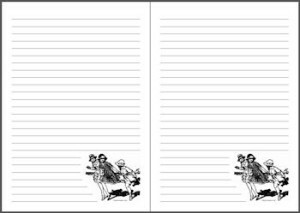 Once printed, either use them as-is for notepaper or letter paper, or punch holes to add them to your A5 planner. I’ve put together a Personal planner sized page as well, but have no idea how well it prints. It’s probably best used for printing directly onto personal sized blank pages, but I’m guessing you could probably get three across an A4 page and then cut them. Philofaxy has a great printing tutorial (personal page size is at the bottom). Note that these pages all have the margin on the left, so aren’t meant for printing back to back. This entry was posted in Downloads, Stationery and tagged Custom Inserts, Printables by Sammie. Bookmark the permalink.